Ok, here's my second 4-F article, this time examining ROMSTAR, the "I can't believe it's not unlicensed" NES game creator! They're bikes! And they rally! Quite some time ago, I talked a little bit about Rally Bike's cover art...but I didn't really get into the game itself. I guess it would be easiest to summarize it as "an overhead version of ExciteBike"
There's other racers and a "Ranking" count (making it seem like you're racing), but its really just a race against the clock. However, unlike ExciteBike, it acts a little bit more like the overhead-shooting-game it faintly resembles: racers, walls and obstacles will all kill you if you crash into them; you have a short supply of lives; and on top of that there's a "gas gauge" that runs down as you go and basically functions like a fake energy meter. 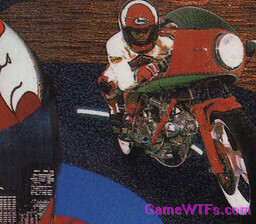 There's also some fun power-ups, the most bizarre of which summons two tiny motorcyclists that hover next to you, Gradius-"Option"-like, and allow you to safely bump other rallyin' bikes out of your way if they get too close. But still, it's a pretty dry, bare-bones experience. Not the blandest race-the-clock NES game I've played (that would be Rollerblade Racer), but not great. There's the "control" slider (for left/right tilt) and the 'power' slider (for...uh, how much blasting power and/or override of tilt it does). It's kind of fun, and it's hard to get a strike each time (so you get to play with placement and control to pick up some wicked "spares")...but each frame is pretty much like every other frame. ...but tune in next time -- the third ROMSTAR game I tried had a little bit more going on; including one of the best broken-English subtitles since GunForce!